The first day of Pujiang Line's test operation was not busy, but officers predicted a large number of passengers on Monday. The first morning of Pujiang Line’s trial operation on Saturday was not busy. 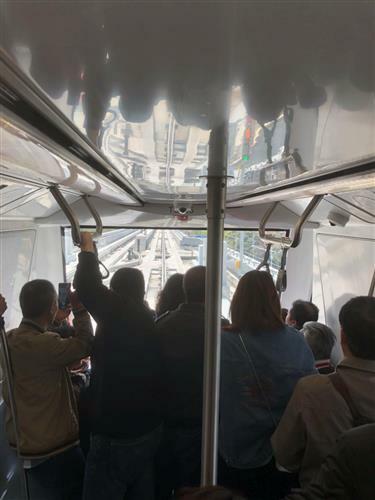 Many residents in Pujiang Town in Minhang District took the new line to have a look at the city’s first automated passenger mover, a driverless train. All motions of the train, including starting, braking, opening and closing of the carriage doors, are automatically controlled. Shanghai Daily reporter boarded the train around 11am and saw many passengers, mostly children and elderly, scramble for the large windows at the head and tail of the train for the view. The line starts from Shendu Highway where passengers can change to Line 8. It took about 15 minutes for the four-carriage elevated train to reach its destination at Huizhen Road. Lin Xin and her 9-year-old son Ziyi boarded the train at Huizhen Road. Her family and friends were going to Pujiang Country Park near Shendu Highway Station. Yu Miao, operation director of Pujiang Line, said the APM train allows a smaller radius of turning circle, making it easier to go through residential neighborhoods. But in the meantime, it would make the train a little bit shakier. With Pujiang Line putting into service, the total length of Shanghai Metro network reaches 673 kilometres, covering 395 stations. Passengers pack the front of the train of Pujiang Line to have a better view in Shanghai on March 31, 2018.